Children learn early that is is not acceptable to steal written words from other people. Of course, that does not mean that everyone follows these copyright laws. As a teacher, I had ways to check to see if my students were plagiarizing their book reports, essays, and other items. It’s sad to say that tools exist for teachers. This was probably part of the reason why I made book reports into projects that were more creative and outside of the box. They were more fun to correct and share. Plus, they were harder to copy from a source. As a parent, I have had to explain to my nine year old that when he needs a photos for a project we have to go to sources that are acceptable. Simply using Google images to hunt something down is not allowed. This is something that many schools are starting to explain to students, but with budget cuts many technology education curriculums are being slashed. This often means internet usage and copyright laws are not being covered properly. We need to make sure that our children are following these. This remained on their website for a few days, then the website vanished. Of course, not all content thieves leave a trail. Case in point – the NickMom website (that I refuse to direct you to). If you have not heard about their massive blunder, you must head over to read Amy Lupold Bair’s post where she introduced the blogging community about the tactics of NickMom. Kelby Carr, Type-A Mom, continues to update her post about how NickMom is sliming parent bloggers. More and more bloggers have written about how to protect your photos after they realized their items were stolen. The reality is that NickMom continues to publish content that is not theirs and will not remove it unless the owner notifies them. I love the way Emily, ColoradoMoms, puts it. The picture of her adorable son and the caption are spot on. Nichole Smith, The Guilty Parent, compares this tactic to stranger danger. These wonderful women, and so many others, have now written about this topic, but one post really hit home. It was from Sarah, Nerdy Apple, on why she left NickMom. As someone who once left a writing job because I was worried about my reputation, I applaud Sarah for standing up and protecting herself. As a community, we must unite to protect each other and stop people from thinking that it is acceptable to take content without permission. Had you heard about the NickMom drama and have you ever had someone take your writing, photos, or other work without your permission? Would love to know your take on this ever growing issue in the blogging world. I haven’t heard about this particular site but I do recall a few years back when another blogger had photos of her children lifted from her blog and represented on another blog as that person’s children. It was very spooky at the time but I now believe there is so much great blog content out here, it is getting stolen all the time. Very sad. Menopausal New Mom´s last blog post ..Aloha Friday – How Late Is Too Late to Call? Have not heard about this so don’t feel I should comment. I haven’t heard about it, but I have heard it could happen. I need to remember to put my name on my pics. I always forget. That reminds me… LATER! Oh, and have a great weekend. Xmasdolly´s last blog post ..Flashback Aloha Friendship Friday! LOVE the photo/poster thing you had to connect with the thieves link! That is total piracy! If I ever want to use a photo, I always try to link it back to where it came from or to say WHERE or WHO I “borrowed” it from – that’s the only decent thing to do! Hard to believe that people really think it is alright to STEAL!!!! 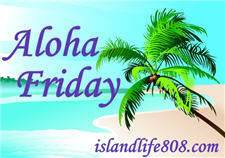 Nancy @ Ollie McKay’s´s last blog post ..Aloha Friday Fans! I have not heard of the drama. I’m glad you had your issue sorted out! I remember that anniversary post. JamericanSpice / Colette S´s last blog post ..Smoochie First – Aloha! I had someone steal an entire post once – and mangled it to boot. I LOVE the idea of swapping out the image like you did – that’s genius!! :) I did hear about the NickMom fiasco – it’s just plain crazy. Good gravy. I just read about this on your hubbie’s site and had to check it out. I can’t believe a site like that would do that. I thought it was some 2 bit blogger at first. Harriet´s last blog post ..Marge Simpson in Glamour? I love Techy Dad’s solution to having someone steal all of your content. It’s just so awful that it has to happen in the first place. What NickMom is doing is even worse. They should know better and they don’t even seem to care. I think the NickMom fiasco is an eye opener for all bloggers. It will be interesting to see how it plays out.